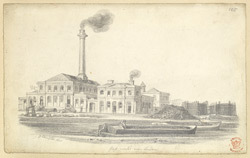 This drawing depicts one of the large gasworks that operated near London in 1825. These large complexes were built to satisfy London's increasing demand for gas, which was mostly used for street lighting. The capital was experiencing heavy development in 1825, due to the construction of important buildings such as Hammersmith Bridge, the Thames Tunnel, Buckingham Palace and London Bridge!